There is a lot of buried treasure in Minnesota. On this page I have listed some of the stories that have circulated for years. If you want to search for one or more, you should research the stories to get more information. Finding treasure is more about the research than it is the actual searching. So where do you go for more research about a hidden treasure? There are multiple areas that may offer the information you are looking for. You can use the Internet. But be careful. Most of the information there is rehashed, and not reliable. You can visit historical associations in the county, or town that you will be searching. Much historical information today is stored on microfilm. Sometimes, when using microfilm, or old newspapers, you can pick up bits and pieces of information regarding the treasure you are looking for. Take notes, ask questions of any lead you may have. The more information you retrieve, the easier your search for buried treasure becomes. 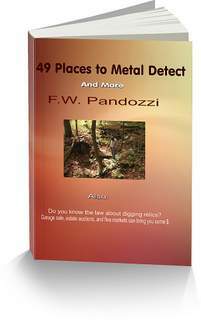 You should also have a reliable metal detector. If you purchase a less expensive model, for approximately $250, then read the owners manual and practice using it, you will become efficient enough to find relics, coins, jewelry, and yes, maybe a buried treasure. Large Gold Nuggets, were found on the banks of the Red River near Robbin, in the early 1940’s. No one knows how the gold got there. They may have been lost during a shipwreck, and then later washed ashore. Could there be more nuggets in that area? The Joseph Winther Treasure, is a supposed buried cache of gold coins. A story says that the farmer Winther buried the large amount of gold on his farm before he died. The Ma Barker - Karpis Gang, buried $100,000 in paper currency, which was ransom money for a kidnapping. The money was buried in a meal box, beneath a fence post somewhere along a ten mile expanse of route 52 between Chatfield and Rochester. Apparently, upon return, the gang was unable to locate the exact spot where the treasure was hidden. Near The Old Soldiers Home, on the west side of the Mississippi River there may be a treasure of approximately $5000 in gold coins. The cache was buried by a settler during the Civil War. The Bootlegger Treasure, is another supposed treasure of cash. During the Prohibition, the bootlegger buried the stash on the banks of the Mississippi, near Lake City. Apparently, the bootlegger was killed in a car accident before he could return to his cache. There are Federal Laws you need to pay attention to. Here are the Minnesota laws. Buried treasure in Minnesota may be located in ghost towns.